The Nashville Predators have signed minor league forward Adam Helewka to a one-year, two-way contract that will cover the 2019-20 season. Helewka is currently playing for the Milwaukee Admirals after being acquired from the Arizona Coyotes organization earlier this month. The team has also announced a one-year, two-way extension for Laurent Dauphin, who also came over from the Coyotes in that trade. Both Helewka and Dauphin will make $700K at the NHL level in 2019-20. Helewka, 23, was originally selected in the fourth round by the San Jose Sharks in 2015 and has developed into an effective minor league scoring threat. The 6’2″ winger has 38 points in 48 games this season including seven in seven since joining the Admirals. Helewka was scheduled to become a restricted free agent after this season when his entry-level deal expired, but will not have to deal with a long negotiation. He has yet to make his NHL debut. Dauphin meanwhile has already has 35 NHL games under his belt after making his debut back in the 2015-16 season. The 23-year old center was a second-round pick nearly six years ago, but has spent nearly the entire season in the minor leagues where he has 24 points in 41 games. Both players are not expected to play large roles on the Predators moving forward, but will provide inexpensive depth options for their minor league club. Schmaltz has been a dynamic offensive presence since joining the Coyotes, showing just why they felt he was worth trading top prospect Dylan Strome away to the Chicago Blackhawks. With 14 points in 17 games since switching clubs, the 22-year old has already climbed ahead of full-time players like Nick Cousins, Christian Fischer and Lawson Crouse. That’s exactly what the Coyotes needed, and what they’ll sorely miss with him on the sideline. Arizona has scored just 101 goals on the season, and in a year that they were hoping to take a substantial step forward are now just 17-21-2. Without a big turnaround the team is destined to miss the playoffs for the seventh consecutive season, something that eventually will force upper management to take a close look at who is steering the ship. The development simply hasn’t been there from some of the team’s key young players, something that has been magnified given their long list of injuries. Schmaltz’ absence will give an opportunity for someone else, but they’d certainly rather have him on the ice. 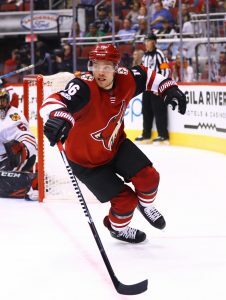 The Arizona Coyotes have lost one of their top players for a while as the team announced that winger Michael Grabner will be out indefinitely after suffering a severe eye injury during the first period of Saturday’s game against St. Louis. The 31-year-old took a stick to the face from the Blues’ Sammy Blais (picture of injury via AZSports Craig Morgan). Grabner was a key offseason acquisition for the Coyotes who are trying to build up their top-six. The team signed him via free agency to a three-year, $10.05MM deal on the first day of free agency. The winger is coming off two straight 27-goal seasons and is expected to add some much needed scoring depth. Grabner has six goals and 11 points so far this season in 25 games. One key reason the team brought Grabner in was his ability to play on the penalty kill unit, which has been very successful for Arizona this season as the unit is ranked first with a 89.7 percent kill rate. Grabner himself has a NHL-high four shorthanded goals this season. 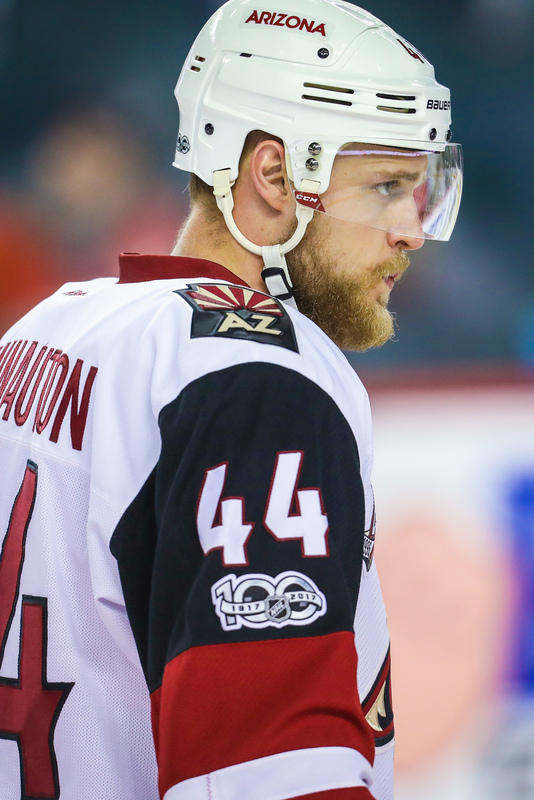 Richard Morin of AZSports writes the team will recall a player from Tucson, suggesting it might be Laurent Dauphin. The Arizona Coyotes announced they have signed restricted free agents Michael Bunting, Laurent Dauphin and Hudson Fasching to one-year, two-way deals. The team included defenseman Trevor Murphy in their announcement, although Murphy’s deal was initially reported Friday. With these signings, the Coyotes have just one restricted free agent remaining in Marek Langhamer. Bunting is coming off a breakout season with the Tucson Roadrunners. After two seasons in which he produced 11 and 13 goals for the AHL franchise, he broke out with a 23-goal performance this year, tied for the team lead in goals. The 22-year-old winger was a fourth-round pick in 2014 and was considered to be a late-bloomer at the time as he didn’t pick up hockey until well into his teens. His entry-level deal had him earning $925K. Dauphin had a busy year last season as he was included in an offseason trade to the Chicago Blackhawks so the Coyotes could get veteran defenseman Niklas Hjalmarsson, but Arizona reacquired him at midseason along with Richard Panik in exchange for Anthony Duclair. The 23-year-old impressed the Blackhawks in training camp, but was inevitably sent to the AHL, where he combined for just nine goals, down from his 17 goals from the previous year. He did manage to get into a couple of Coyotes’ games, but is likely headed back to Tucson in hopes of bouncing back. Fasching signs after coming over from the Buffalo Sabres’ organization exactly a month ago in a trade for college prospect Brandon Hickey and Mike Sislo. The 22-year-old winger came off a solid season with the Rochester Americans in the AHL, posting 12 goals and 30 points, which also included a five-game visit with the Sabres. Fasching spent three seasons playing for the University of Minnesota.